A giant yellow rubber duck on display in a Taiwanese port has burst in unexplained circumstances. The 18 metre (50 foot) inflatable duck suddenly collapsed on Tuesday, only 11 days after it had been put on display in the port at Keelung. Organisers are unsure as to the cause of its demise, but one theory is that it was attacked by eagles. 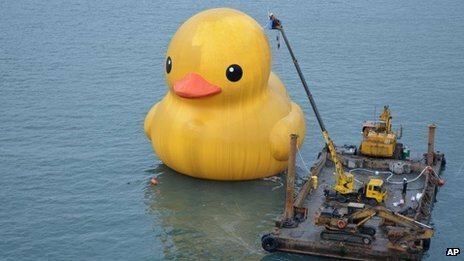 The duck was designed by the Dutch artist Florentijn Hofman to be a giant version of a popular bath toy. Last month a similar duck was damaged elsewhere in Taiwan, when an earthquake triggered a power outage that caused it to deflate. A third Taiwanese duck was brought ashore in September because of an approaching typhoon. A large crowd had been anticipated in Keelung Port for New Year celebrations, and the rubber duck was due to be an important part of the festivities. But video footage showed the giant inflatable suddenly bursting in front of scores of people gathered on a quayside. "We want to apologise to the fans of the yellow rubber duck," organiser Huang Jing-tai told reporters. "We will carefully examine the duck to determine the cause." The original duck designed by Hofman has been transported around the globe since 2007, visiting cities including Sydney, Sao Paulo, Hong Kong and Amsterdam. The artist hopes the works will bring people together and encourage a connection with public art. Despite the ducks' misfortunes, they have been a big hit among the Taiwanese.